COCHABAMBA, Bolivia, Apr 4 2012 (IPS) - Their skill and dexterity in weaving textiles, to be worn on festive occasions or displayed in windows for sale to tourists, have become the mainstay of indigenous women and their families in Cochabamba, Bolivia. “We have always been discriminated against, because we are regarded as not contributing economically, but this is going to change now that we are organised. Our abilities with yarn were never valued, even though many women are highly professional weavers,” Severina Aguayo, a 25-year-old peasant farmer and weaver, told IPS. Aguayo lives in the ayllú or traditional indigenous community of Chalviri, in Bolívar province, at an altitude of 4,000 metres above sea level, in the central region of Cochabamba, whose capital city bears the same name. She coordinates community organisations of women weavers, and is one of the promoters of a new native weaving project which got under way in February in seven municipalities in four provinces within Cochabamba region: Arque, Bolívar, Tacopaya and Tapacarí, which constitute what is known as the Andean fringe of the department. In these rural, sparsely-populated provinces, which are home to just 100,000 people out of a regional population of 1.5 million, most of the inhabitants are native Quechua-speakers, and around 98 percent of the population lives in poverty and lacks basic services. Struggling with poverty, the barrenness of the land where they grow subsistence crops, the cold temperatures of the highlands and neglect by the state, the women of these provinces have decided to make the most of their competitive advantage: their weaving skills. Their goal is to produce woven materials, using traditional techniques passed down through the generations, and sell them to earn their own income that they can use to improve life for their families and communities, Aguayo said. Past experience has taught them that they cannot do this on their own, but must join together and get organised, secure the support of local and regional authorities to provide technical assistance, and administer their products themselves so that the fruits of their labours are not siphoned off by others, she said. The Andean communities in Cochabamba are renowned for the quality of their traditional weaving. Both women and men are true artists at their homemade manual looms. Woven from wool and especially the fine soft fleece of the alpaca, a domestic animal similar to a small llama, each piece is unique and embodies the feelings and experiences of its creator. In their homes, the weavers dye their yarns with natural colourants made from local plants, design the textile pieces, and weave them on floor looms, using tools made from llama or alpaca bone. Blankets and rugs, sweaters, scarves, bags or belts feature the geometric designs representing animals and plants that are characteristic of the Mosoj Kawsay (Quechua for “New Life”) weavings. Unique to the Andean fringe of Cochabamba, the designs vary depending on the occasion and whether the recipient is male or female, single or married. Most of the women’s woven pieces are made for family members, and sales have so far been limited. But in 2005 the Association of Andean Artisans was formed with 200 members, 90 percent of them women. The association has a store in Cochabamba, the regional capital, and also exports goods to the United States and Europe. 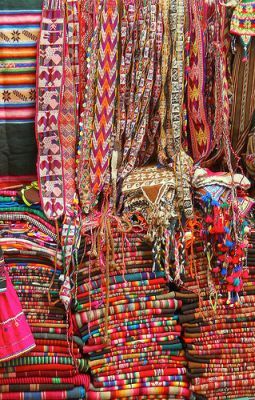 Export sales matter because a blanket fetching 20 dollars in the Cochabamba store may be sold for over 100 dollars abroad, Carmen Cardozo, the store manager, told IPS. “Production costs are high because the items are labour intensive and the yarns are expensive, and local people do not want to pay what they are worth,” said Aguayo. “Through the new project, we want to increase production – first of all, to ensure food security and sovereignty for rural families, and secondly, to generate incomes so that women are not dependent on men, but have autonomy and can make their own decisions,” Sabina Orellana told IPS. Orellana, who was raised on a small farm, is head of the Equal Opportunities Directorate for the Cochabamba regional government. Her experience in different projects has led her to believe that as long as rural women are dependent on men, they will be subordinate to them and victims of discrimination. “We don’t want to set women at odds with men, but we want the inequality between them to be at least partly evened out, so that women’s decisions are respected and women have their own economic resources,” she said. Orellana added that the Andean fringe provinces offer women few alternative sources of income other than weaving. Raising chickens or other animals is impractical because of the lack of pasture and forage. And because of the lack of water and extreme temperatures, it is difficult to grow anything other than the locally consumed staple crops, potatoes and barley. Income from textile sales is “a great help, economically” for women in native villages, because they have nothing else to turn to, said Filomena Flores, a young woman from the ayllú of Chiñoata, in Arque, who is now living in the regional capital, Cochabamba. Flores told IPS that although when she is in the city she does not weave, she does so whenever she returns to her village. She learned the art at a very early age from her mother, who weaves in the hours she has to spare after work in the fields and household chores. The regional government of Cochabamba has promoted various projects with a gender perspective to boost productivity. But Orellana said the previous schemes were conceived by technical experts, without input from the communities and local organisations. In addition, they did not ensure women’s real participation, and meetings were attended by men who took all the decisions. To correct these mistakes, the regional government approved the proposal from the Mosoj Kawsay Weaving Sales Improvement project, which has a budget of 170,000 dollars for 2012-2013, and will initially benefit 555 women. Seventy-five percent of the project’s budget is financed by the regional government, 20 percent by the municipalities, and five percent by the communities themselves, to ensure sustainability and avoid creating the impression that the money is a handout. As well as offering technical assistance for recovering time-honoured traditional practices, the project will provide the supplies needed to produce woven textiles, and identify markets for the goods. According to Orellana, an essential aspect of the project is “yananti”, the ancestral Andean concept of equilibrium between complementary opposites, so men and women contribute equally to the collective businesses that are set up to benefit families and communities.